A whale watching boat and seafood restaurant at the Kennebunkport Maine marina. The Kennebunks – it’s a name that sounds like old money being newly pressed, or the prow of a 35-foot yacht cutting gracefully through the current on a bright blue day in early August. It’s a name that brings to mind summer garden parties, oversized hats, mint juleps and weekend trips to the Kentucky Derby or the America’s Cup. If you sit back and daydream for twenty minutes, then images of the famous and the fortunate, of genteel artists, novelists and wealthy summer people begin to color your mental picture of this part of coastal Maine. The Kennebunks is the moniker given to the villages of Kennebunkport, Kennebunk, Arundel, Cape Porpoise and Goose Rocks. This quaint jumble of seaside and inland villages is like a Top Ten List of Maine’s Best Attractions, and that is why the local population of 15,000 triples in high summer. From shore walks and salt marshes to colorful fishing shacks, architectural masterpieces and upscale boutiques, this is one of Maine’s preeminent summer destinations. Downtown Kennebunk is bejeweled with colonial revival inns and Victorian mansions (think Ocean Drive in Newport, Rhode Island) and the old world sophistication is accentuated with sandy beaches, salt-preened air and a flourishing restaurant scene. The first-time visitor will find the geographical layout of The Kennebunks to be haphazard and confusing, and although the Kennebunk River acts as a border between the towns, it is better to approach the area as if it were a single entity. It would be impossible to count all of the white-clapboard houses in Maine, but Kennebunk has some of the most regal and imperial looking clapboards in New England. Kennebunk amassed great wealth in the 19th century as a shipbuilding mecca, and the numerous mansions attest to its nautical heyday. Kennebunk is divided into two villages. When you drive down Route 35, you can’t help but gawk as these palatial manors and colossal palaces are spread out on either side of the road. After your jaw drops and you pick it up off the floor of your SUV, head down to Beach Avenue. This is where you will find Kennebunk Beach, a grand and gentle swath of coastal heaven. There are so many notable homes in the area that a walking tour is a necessity. If you start at the Brick Store Museum, head up Main Street and marvel at the Nathaniel Frost House and the Benjamin Brown House, as both are extraordinary examples of 18th century architectural styles. Visit the 1773 First Parish Unitarian Church. Be sure to check out its steeple, as this is where you will surprisingly find the original Paul Revere Bell. Summer Street is another must-see architectural showcase of beautiful and notable homes. The Parson’s Way Shore Walk is a spectacular, 4.8 mile round trip along the rocky coast. It will take you all the way to Walker’s Point, where you will find the Bush family’s sprawling mansion, one of the areas most visited and photographed sites. Kennebunkport is the most touristed section of The Kennebunks. Most of the town’s activity is concentrated around Dock Square. Winding alleys are lined with shops, art studios, craft boutiques, restaurants and other facets of the tourist trade. The drawbridge marks the center of town, and it is the perfect place to admire the Kennebunk River. Be Warned: the crowds in the summer swell in Kennebunkport to epic proportions. If you do not feel like fighting through the masses, then take the Intown Trolley tour. The 45-minute ride will help you get acquainted with the area as well as avoid the throng of tourists. Now that you’ve got trolleys on the mind, why not visit the Seashore Trolley Museum? Streetcars built from 1872 to 1972 are all on display at this restoration museum on Log Cabin Road. A quick trip off-the-beaten path will take you to Goose Rocks, Arundel and the Kennebunk Plains. Goose Rocks is a 3-mile stretch of white sand and shallow pools. It has long been a family favorite. Summer theater is a popular pastime in Maine. In Arundel, you will find evening performances and matinees at the 19th century Arundel Barn Playhouse. Do you feel like going for an adventure? The Kennebunk Plain (known as the wild blueberry plain to locals) is 135-acres of protected grasslands and scrub-oak woods. Maintained by the Nature Conservancy, rare and endangered vegetation, wildlife and blueberries can all be found there. Visitors can even pick their own wild blueberries after August 1. Many of the historic mansions in downtown Kennebunkport have been converted into B&Bs and inns. They are formal and immense, but never stuffy, showering their guests with romantic charm instead of museum-like accouterments. Still, where else can you see a suspended elliptical staircase, Waverly wallpaper and the type of magnificent ocean views typically reserved for travel magazines? From the White Barn Inn to the stately Captain Lord Mansion, once you see the king-sized canopy bed or slip into the hydro-massage body spa, you know that you are now living the life of the fortunate and famous. If you have come this far, skip the restaurants with the paper placemats that detail How to Eat a Maine Lobster, and go for broke. Lobster Savannah is a house favorite in The Kennebunks. Once the chef splits the lobster, they fill it with shrimp, scallops, mushrooms and Newburg sauce. Decadent and rich, it is a once-in-a-lifetime kind of meal. 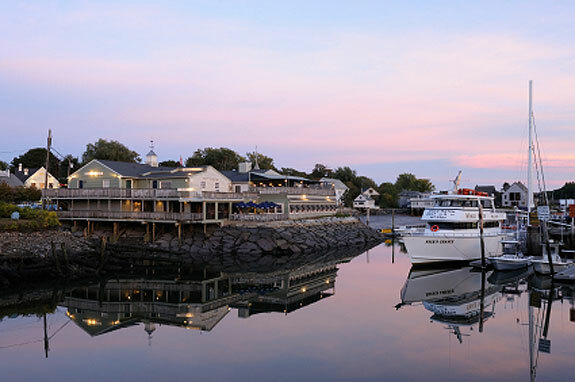 Visit the following directories to find lodging, dining, attractions, shops, services and recreational activities in the Kennebunkport, Maine area.